The SJD Barcelona Children’s Hospital has celebrated the start of the building work of the future SJD Pediatric Cancer Center Barcelona (destined to be one of the largest and most important paediatric oncology centres in Europe) with an event involving many of the donors who made this project possible through their generous contributions. That is why the symbolic laying of the foundation stone of the future centre of pediatric oncology has been carried out among all (donors, patients, volunteers and workers). Participants have helped build the words "For the brave" [Para los Valientes] with 100,000 pieces of Lego. This large sculpture will preside over the entrance hall of the new centre. At the beginning of the act of gratitude and the laying of the first stone, 2.7 million of the 30 million that will complete the first phase of works of the future centre were still to be collected. During the appearances of the participants, an unexpected announcement has been made: part of the donors will complete the amount that was missing to achieve the objective. Who has made the SJD Pediatric Cancer Center possible? Whilst the new centre owes much to the contributions of thousands of private donors, the start of the building programme would not have been possible without the initial contributions of the founding donors, who not only provided significant economic support, but a number of them will also sit on an advisory council overseeing the development of the programme during its execution. The founding donors are Fundació Leo Messi, Fundació Barça, María Ángeles Recolons, Stavros Niarchos Foundation, Fundació Bancària “la Caixa”, Andbank, Esteve, Fundació Nou Mil.lenni, Grup Simm Imatge Mèdica and a tenth entity who would prefer to remain anonymous. Since the launch of our fund-raising campaign in February 2017, we have raised 30 million euros. This constitutes the largest amount ever raised in Spain by civil society for a project of this nature. The #ParaLosValientes (#ForTheBraveOnes) campaign counted on the participation and support of the professional football player Lionel Messi, who, together with patients of the Hospital, played a lead role in the recording of some videos aimed at raising awareness of the fund-raising campaign. 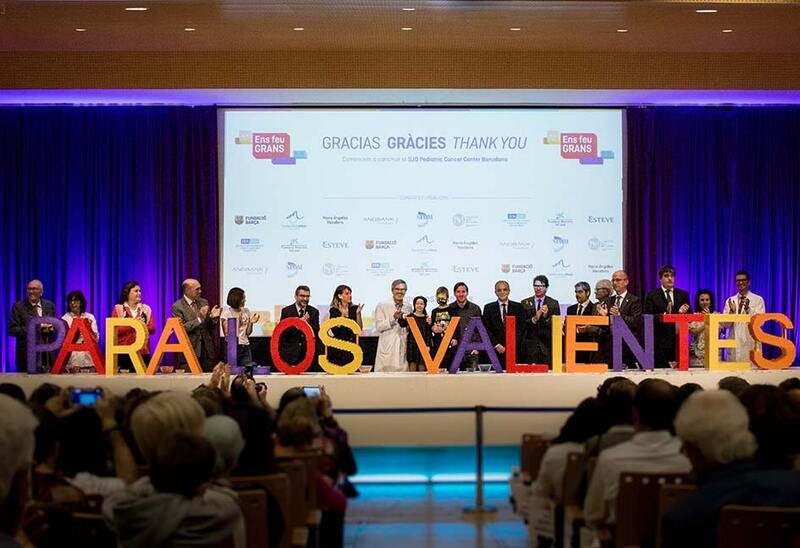 During the last year and a half, when the campaign was launched to collect the amount needed to build the largest pediatric oncology centre in Europe in Barcelona, 30 million euros have been collected. It is the highest amount collected among civil society in Spain for a project of these characteristics. The campaign counted with the participation and help of professional footballer Leo Messi who, along with patients of the Hospital, starred in a series of videos whose objective was to raise the maximum possible amount of funds. As a result, thousands of individuals and a large number of companies and entities from different fields have responded to the call. More than 100,000 individuals have collaborated economically in the project by making donations and participating in any of the 191 solidarity initiatives that have been organized to raise funds. Among these citizens, initiatives have been the sale of calendars, solidarity shields, the organization of popular races, parties, chocolates or anniversaries. The campaign has also had the participation of a large number of companies, more than 150, which with their collaboration have helped to reach the current figure. What will the future SJD Pediatric Cancer Center Barcelona be like? The new SJD Pediatric Cancer Center Barcelona will be able to treat 400 patients per year, 30% more than the SJD Barcelona Children’s Hospital is able to at present (215 cases each year and 70 cases of recurring illness or second opinion referrals), and will incorporate the latest technologies and methods in the fight against cancer.